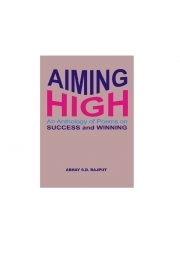 Description of "Aiming High (eBook)"
Aiming High is an anthology of poems on success and winning. The author, Abhay S.D. Rajput, proudly calls his poetry as success poetry. Success poetry is the expression of motivational and inspirational thoughts through poetry that leads the reader to success and winning. The poems are written is simple, exciting and impressive style to motivate and inspire the reader to remain on the success track or to bring the reader back on the track. The main essence of the poems in this anthology is motivation and inspiration to move on the success path till winning is achieved. These poems are a must read for anyone going through breakdowns and desirous to take the charge again. Especially the corporate world, students, unemployed youth and the beginners in the career ladder should go through Aiming High and get benefitted from the insights and inspiration presented in the poetic format as success poetry. Success poetry, a new genre of poetry, offers powerful expressions and exchange of knowledge which are sure to make the reader seriously think about and adopt in making their life successful. In this fast life, many times a person feels disappointed, depressed and frustrated with no ray of hope. The entire world appears as if embraced by darkness only. Morales get down and down. Here, Aiming High comes as a magical remedy for converting disappointment, depression, frustration and hopelessness into enthusiasm, positive energy, courage, desire to win and hopes for winning. Feel the warmth of the positive energy flowing in your mind and body while reading the motivational and inspirational success poems. Whenever you feel down, just read any of the Aiming High poems and get sparked to a higher level of consciousness and see the miracle it brings in your life. Reviews of "Aiming High (eBook)"